Has anyone else ever had this problem? It seems to happen randomly. I do on-site repair work, always going to a different location. So I use my navigation almost daily. I just use regular old Apple Maps. Sometimes I type in an address, sometimes I tell siri. Occasionally I send the maps over from my home computer (which may be one of the triggers of this, I'll need to do more testing). So normally you pick your address, you hit "GO" and you're off with maps and verbal turn-by-turn directions. When this no-navigating problem happens, you hit GO, and you get a map, but it's as if you haven't actually picked your router. Yet somehow you get sort of an overview summary of the 'steps' of your directions, but it doesn't read them to you, or indicate turns coming up. Yet it knows exactly where you are. You can have your waypoint drive right down the route tracking you, and theres a blue route line, but they aren't "linked". It's extremely annoying. There doesn't seem to be a way to KICK it into navigating. The day I took the screen shot below, I was repeatedly cancelling navigation, and reinitializing my route, but it kept getting stuck and not giving me directions. Does anyone else ever have this problem on their iPhone? My phone is an iPhone 8 running the newest iOS. I've had this problem in the past on my 6S too. This happens whenever the "From" location is a fixed address, rather than "Current location". Even if that address is your current location when you start, Maps will be in a different mode, as you have discovered. Don't tap Go yet. Tap the blue text after "From". Replace the text there with "Current location" and tap Route. 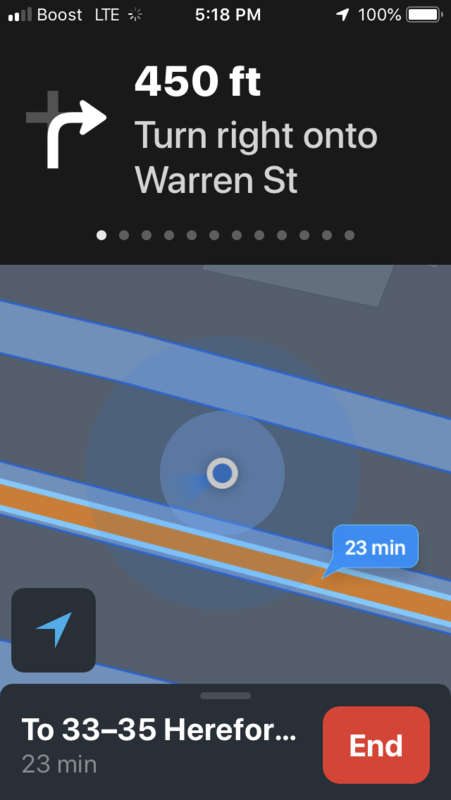 Routes with a fixed start address would probably be from Apple Maps on your Mac, which doesn't offer turn-by-turn directions. If you want to remove these from your history on your iPhone, swipe left on those items in the list. Not the answer you're looking for? Browse other questions tagged iphone siri navigation . No 3G but have wifi- have been on phone with apple and provider for 5+ hours total. Ideas? What hardware problem could be the cause for my 5C's becoming unresponsive for days?